One of the great advantages of using a softphone based communications system like Skype for Business (S4B), is the sheer variety of compatible audio and video endpoints to choose from. Simply browse on over to the Lync catalog and check out the qualified device page to see the ever growing ecosystem of certified devices available. Home based users certainly have different needs and requirements than a cubicle based, or nomadic user may have. Luckily the Lync (S4B) ecosystem continues to expand with new, and some might say exciting, developments. Today, I will provide my thoughts and observations of the new Jabra Evolve 80 UC Lync headset. The Jabra Evolve 80 is the latest Microsoft UC offering from the folks at Jabra, one of the leading headset manufacturers. I have had this headset for over a month now, so this is no “just-out-of-the-box” review. This headset has become my daily driver. I use it all day long. As a mostly home based worker, thanks to my job and S4B/Lync , I spend a great deal of time at my computer, in my home office, alone( at least in terms of people in the same room).Because of this fact , I don’t mind wearing a binaural headset, in fact I personally enjoy it. However, if you work in a noisy office you will more than appreciate the “comfort zone” that this headset provides, thanks the noise canceling feature. If you like to stream your favorite music or podcast while you work on that latest masterpiece, spreadsheet, or quarterly report, you will love the Jabra evolve series. 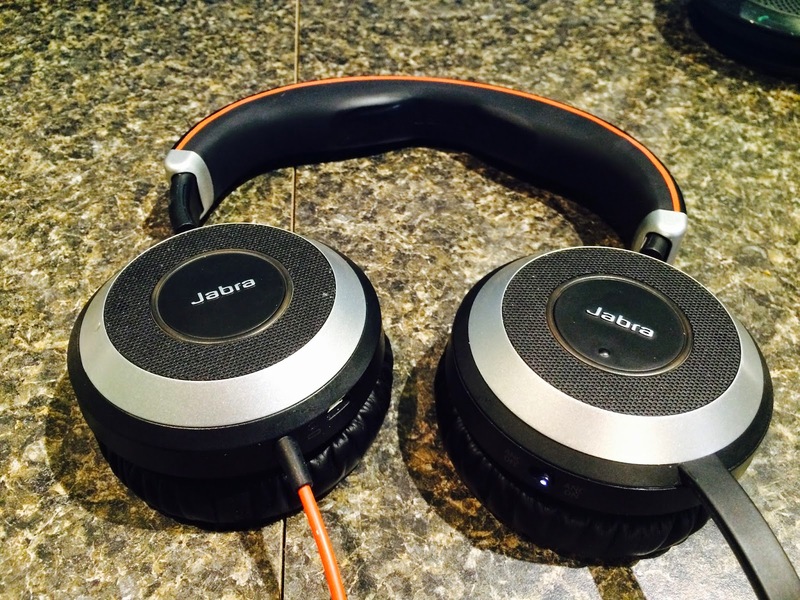 Right out of the box, it is easy to see that the Jabra Evolve 80 UC is a high quality device. The package consists of the headset, which has leather ear cushions and a standard 3.5mm phono plug, as well as the UC USB Adapter, which provides you with the requisite Lync call control functions, such as answer, mute and volume control. The adapter also has a “busy” light that controls the matching indicator on the headset. The Jabra Evolve also has a fold up boom mic (which mutes the mic) and folds flat for storage (more on both these items in a moment). A soft carrying case is also included for travel. In my mind, there is no doubt that after the quality stereo response from this device, the best feature is the active noise cancelling (ANC) option. A switch, located under the right ear cup, lets you enable or disable this feature. Turn ANC on, and even the most annoying sounds (or coworkers) will fade away. I used these on a commuter train ride and even without any music, I was transported to a silent oasis, smack in the midst of typical rush hour chaos. The ANC circuitry is powered by an internal battery. This battery is charged via the phono plug when the device is used with the UC adapter while using it, and has a micro USB port to charge as well. I have had ANC on all day and not had any issues with battery life. If the ANC does run out of juice, simply turn it off and you still have a fully functional headset. As mentioned, the actual headset has a 3.5mm phono plug and the mic folds away. These two features allow you plug the headset into your phone or tablet and use it like any other headset. Only you know its “true” dual role as a quality UC audio device! Located on the outside of the right ear cushion, is a “tap to mute all” button. This allows you to have a conversation with a colleague, for example, as this button mutes BOTH ANC and Music/Audio. As mentioned by JonMck over at ucomsgeek, the driver for this device allows the adjustment of the “sidetone” of the headset. This is amount of audio picked up by the microphone that is “echoed’ back to you, while you talk. Most mobile phones do a poor job of this , which at least partly to blame for people talking so annoyingly loud on mobile devices, as they have no “feedback “ as how loud they are talking (at least I’d like to believe that is the reason!) Head over to there to learn how to adjust this to suit your personal taste. Note: this is more of a generic audio tip than something specific to this headset, as most newer UC certified “headset” devices will have this adjustment. I call it out here because it’s not well known or easily exposed in windows. Like almost everything else these days, this headset is firmware controlled and updated. The Jabra PC suite is available to flash the device. I am pleased to note that a few updates have come out since I first got this device about 2 months ago. There is nothing more frustrating than a firmware based device that never gets updates( I’m looking at you , cardosystems) At least the good folks at Jabra are working to better their products. It should go without saying, but I’ll say it here anyway, that the first time you use any device you should install the latest available. When I first plugged in the UC link adapter, I did not get my phone controls, a simple update solved that! The Jabra Control center allows you to manage muliple Jabra devices, check for firmware updates and provides several “tweeks” such as pausing windows media player when on a call, and enabling or disabling tones when buttons are used. While devices are getting better every day, personally I have yet to find one that is “perfect”. Based upon the myriad of devices I have used in the past, here is my personal wish list for ads or changes to the way the Evolve 80 UC works. If the folks at Jabra care to read this, I would love to hear their take on some of these items. As mentioned above, the UC adapter has a manual “busy” light. Pressing the Jabra Logo on the adapter will turn both it and the corresponding light on the headset red. Presumably to let your colleagues know you are busy. In the world of S4b, we love automation, especially in terms of presence. I would love the headset to light up automatically when I am in a call. Related to above, why not dual color (RED/GREEN) led announcing my presence like my client or the busylight does? Other headsets allow you to Bluetooth pair your headset so that you can take calls on your mobile and still wear the headset. I miss that feature with the Evolve series. Reversible – As mentioned above, the boom MIC folds up to mute, but it only goes 180 degrees. If the mic went 270 degrees, I could swing it over and swap left and right. , for times that my adapter NEEDS to be on the right side, as the wire comes from the left ear cup, you need to readjust your layout if you prefer the USB puck on the right. Since more people are right handed I would think this would be most common. This means the “default” setup is likely a wire from your left side connecting to the adapter on the right. Note: I understand that left and right are being “enforced” here due to this being a stereo device, but why not allow me to swap left and right in software? None of my “wishes” are deal breakers in any way, as this device is ready for prime time in the right situation. If you are looking for a top quality , multi-function , Lync certified, Binaural headset, for Executive , home , office , or nomadic, users, the Jabra Evolve UC 80 is a fine choice. This is the headset I want to travel with!